When the Mom comes to visit over the weekend it usually means one thing – I’m not watching much TV. Fortunately it’s early in the NFL season and I’ve yet to become completely attached to this season. I’m just mildly attached. So, as her and I were walking through the Grove in Los Angeles I quickly jumped on a computer at the Apple store. I looked to see the score of the Packers game– it was 3rd quarter and closer than I anticipated. I check the box score and saw that Cam Newton was about to throw for 400 yards again… What the hell was I missing? Box scores are probably the greatest thing ever. Who cares if your team is winning, I want to know how everyone is doing individually. After I saw Newtons yards I text my friend and asked if he was outplaying Aaron Rodgers, my friend didn’t respond. I actually still don’t know if he was. This is Cam Newton’s numbers: 28/46, 432 yards, 1 TD, 3 INT’s. This is Aaron Rodgers’ numbers: 19/30, 308 yards 2 TD’s , No INT’s. What does this tell me? It says Cam was slinging the football like a running back didn’t exist. I looked at the running back stats – turned out Cam Newton was their leading rusher – Yards and Attempts. The Box Score tells us this dude doesn’t trust his team. He’s trying to do it all. If he wants to toss the ball 50 times a game and go for 400 yards, be my guest, but there will come a point when Wins will be more impressive. 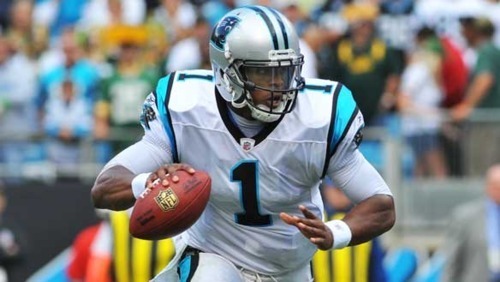 Having said that biased POV from a Packers fan, I think Cam Newton may be the real deal (2 games in to his career). ONE THING THAT STUCK OUT: The Jaguars quarterback Luke McCown was 6/19 for 59 yards and 4 INTs. Apparently they benched him for Blaine Gabbert who threw for 52 yards. Maurice Jones Drew ran the ball 18 times for 88 yards. The Jets D is very good. They’re the combination of the Ravens from 2001 and the Cowboys from the 90’s. They’re really dysfunctional, entertaining, and good. If they had a Ray Lewis type personality then they may never let anyone score a point again. But then again, this is the Jaguars, and the Jags fans are dreaming about David Gerrard right now. ONE THING THAT STUCK OUT: Sure, the Steelers didn’t allow 1 point. Sure, Ben Roethlisberger looks great in his 22/30 298 yard performance. Sure, the Seahawks are still thinking about the Playoffs last season when they somehow won. But the one bright star to all of this is Tarvaris Jackson! Yes, Jackson: 20/29 159 yards passing. It’s weak, yes. But the Steelers D is tough and The Seahawks have a weak offensive line. The Seahawks may actually win a game this year with the Vikings forever back up. ONE THING THAT STUCK OUT: The score itself. The Redskins are 2-0 under Rex Grossman. If you forgot the Grossman predicted the Redskins would win the NFC East this year. Well, so far he’s right. Also, Larry Fitzgerald had 133 yards, that’s over half of the passing yards from Kevin Kolb (251). He’s got to be the best receiver in the NFL. See above. But one more thing: I don’t think the Packers know who their running back is…yet. However, this isn’t a bad thing – if we’ve forgotten, they won the Superbowl with a depleted backfield last year. ONE THING THAT STUCK OUT: No, it’s not the 345 yards from Tony Romo, nor is it how bad Frank Gore was (20 rushes, 47 yards). It’s the 3 fumbles from the Cowboys – Romo, Miles Austin, and Felix Jones. Fortunately they didn’t lose the ball… but this could be a problem down the road. Also, Jon Kitna came in and replaced Romo, he proceeded to throw 2 INTs. I can’t explain why I like Kitna, maybe it’s some sort of pity or because he resembles KANE from the WWE, but it’s not the 90’s anymore and with Romo out, the Cowboys will always lose. ONE THING THAT STUCK OUT: Easy – Bengals QB Andy Dalton throwing for 332 yards, 2 TD’s and no INTs saying F-U Carson Palmer. The secondary thing that sticks out: Cedric Benson only rushing for 59 yards on 16 carries… ehhh… not looking good for the Bungles. ONE THING THT STUCK OUT: Yo! Reggie Bush! Screw you. You’re on my fantasy football team and you’re more up and down than the stock market - 18 yards rushing and 3 yards receiving? Come on, man. Right now the Texans have so much hope, and I like that, they’ve been on the “verge” for so long. ONE THING THAT STUCK OUT: The Raiders were winning 21-3 at halftime and they lost this game? Are the Bills for real? ONE THING THAT STUCK OUT: Matt Cassel and his 3 INTs. I thought he’d be a little better than this after his Kenny Powers Adidas campaign in the off-season. Looks like the Lions D may be gaining some confidence. Could the Lions actually be for real? Stafford = healthy, then maybe. ON THING THAT STUCK OUT: If Matt Hasselbeck throws for over 300 yards on the Ravens D then that’s 100% obvious proof that this defense has officially declined. They’ve been so good for so long this was only a matter of time. But on the flip side they held Chris Johnson for 53 yards. What’s happening? Flacco looks like he was struggling (against the Titans?) I can’t really get a gauge on either of these teams but my gut says the Titans will slip and the Ravens will be above average. ONE THING THAT STUCK OUT: Adam Vinatieri’s 4 field goals (39 yards, 27 yards, 52 yards, 36 yards). Peyton Manning must be going nuts. ONE THING THAT STUCK OUT: Adrian Peterson had 120 yards, 2 TD’s and they still lost? Man, this could be a long year for the Vikings… and for AP. ONE THING THAT STUCK OUT: Matt Forte doing double duty with 10 carries for 49 yards and 10 receptions for 117 yards. Apparently Jay Cutler has found his man. Also, the Bears had 4 fumbles (Cutler, Hester, Hurd, Tillman) - they lost 1. That’s either a shaky offense or the Saints D is pretty good. Brees and the Saints rebounded nicely from last week… they may be very very good. Not to mention they seem to have forgot about Reggie. ONE THING THAT STUCK OUT: The obvious is Tom Brady throwing 3 TDS, no INTs, 423 yards, and spreading the field like mayo to 7 different receivers. Brady… please don’t get injured you’re too fun to watch. But the story here is Antonio Gates getting 1 ball thrown his way with 0 catches. ONE THING THAT STUCK OUT: Matt “Tom Clancy” Ryan shedding the Vickness and tossing 4TD’s. I actually caught the first half of this late game and when I heard Vick was injured I felt really bad. Watching him scramble is so exciting because of how vulnerable he is. Yesterday he looked a little forced and he was playing a possessed city, I can’t figure out why the fans were booing him. Don’t you think prison was enough? A general overall take away from these box scores is the ridiculously high QB numbers. The new league is paving the way for records to be shattered and QB’s to run wild. If you don’t know – The NFL now protects their QB’s more than ever to “prevent injury”. But what that means is they want to keep their golden boys on the field for $$$ reasons. A perfect example is Peyton Manning. Who the F cares about the Colts if he’s not on the field? I kind of like this new rule just for excitement purposes. Should I be scared that the box score is sometimes just as exciting as games themselves? (Words of a Fantasy Football player).